Clary sage or Salvia sclarea is a biennial or short-lived herbaceous perennial in the genus Salvia. This plant is found in the region from Central Asia to the north Mediterranean. It is widely used as a vegetable and also finds application in various medicines. 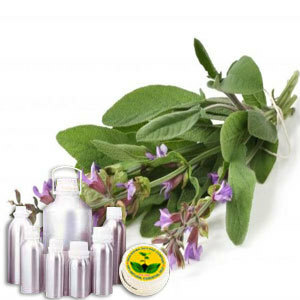 It contains linalool, linalyl acetate, caryophyllene, a-terpineol, geraniol, neryl acetate, sclareol and germacrene D.
A middle note of medium aroma, Clary Sage Oil has a mild earthy, fruity and floral aroma that is also slightly nutty and herbaceous. It blends well with juniper, lavender, pine, geranium, sandalwood, jasmine, frankincense and other citrus oils. This Wildcrafted Oil is mainly used as vegetable and finds it usage in various medicinal preparations. Owing to its sweet smell, it is also used for fragrances.